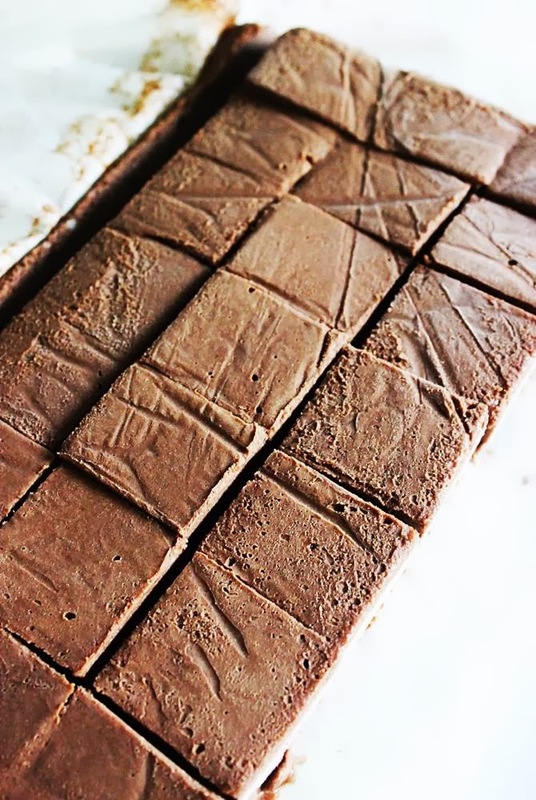 Chocolate banana ice cream fudge – You may fall in love with this freezer fudge as we did. I made these many many times with variations and these are one of the best choco treats that I love to share with family and friends. These are creamy, chocolaty and mouth melting. You can treat yourself by popping one in your mouth whenever you yearn for an ice cream or a choco treat. These make a great summer treat for the kids. It has been 4 years since I posted this & I make it every year during the summer as my kids’ keep asking for it. 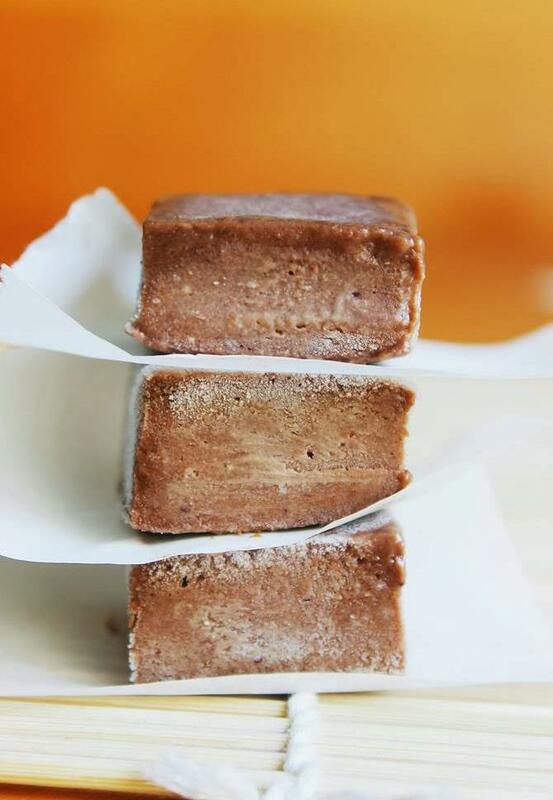 Call it a freezer fudge or a ice cream fudge, but the texture is like a rich ice cream without the use of cream in the recipe. I have used almonds, cocoa, coconut oil and coconut palm sugar to make these delights. You can replace oil with melted butter. You can replace almonds with any nuts you like or can instead use nut butter too. I preferred to use the nuts instead of the butter since I don’t stock up the nut butter. You can use your favorite sweetener like honey, molasses, coconut sugar or just white sugar. You can alter the ingredients to your taste and convenience. 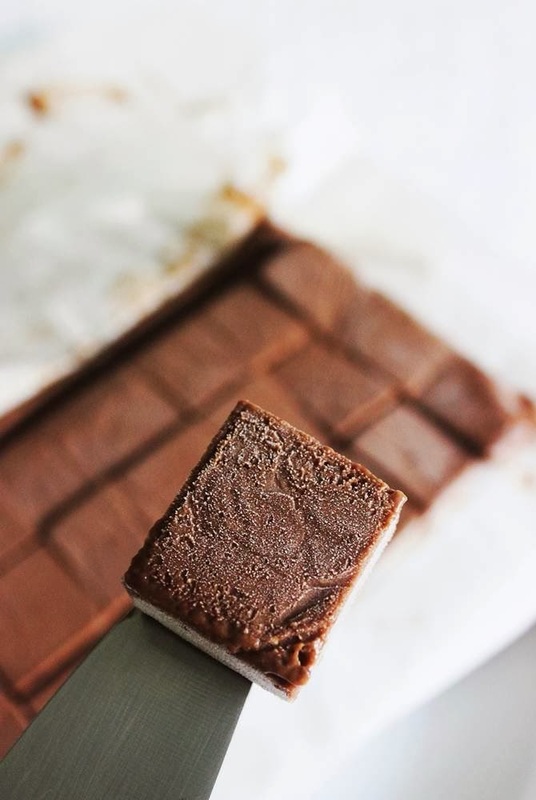 Most freezer fudge recipes call for virgin coconut oil, but even refined coconut oil works fine. Since it begins to melt up in one to 2 minutes. it must be consumed right away from the freezer. I did not line the parchment paper properly, so when i inverted it, got zig zag lines on the fudge. 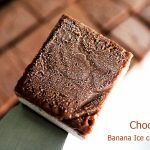 Chocolate banana ice cream fudge or freezer fudge is a quick choco treat that can be whipped up in minutes. Blend the almonds first to a very fine powder. Add the other ingredients to a blender and blend till smooth. Scrape off the sides and blend well till very smooth. Transfer to a square pan lined with parchment paper. Cover it with a foil, cling wrap or lid. Freeze for at least 2 to 3 hours. I freeze my knife as well to get proper cuts. Lift the parchment paper to a board. Cut them to squares. 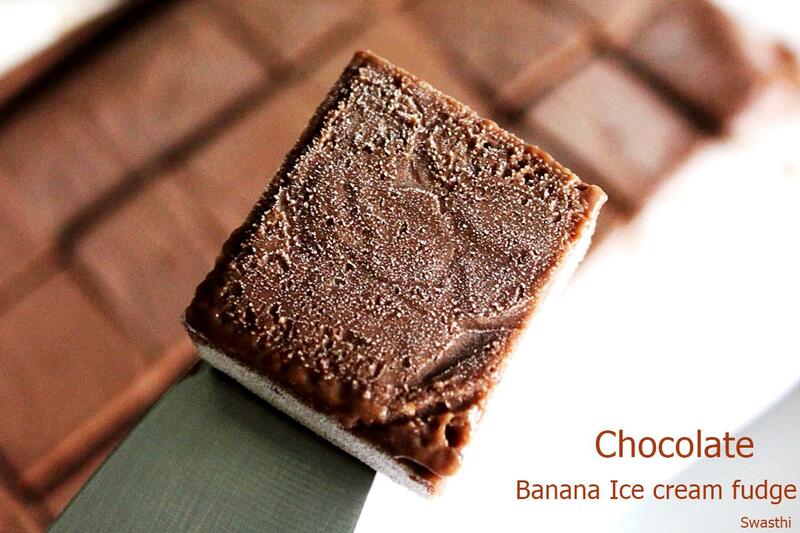 Enjoy chocolate banana ice cream fudge. Stays good for more than 2 weeks in the freezer. But I am sure none will be left once you begin to eat. Good recipe. Its so true what you said ‘none will be left once you begin to eat’, couldn’t stop with just few. It tasted so good that there wasn’t anything left to be stored. My son just loved it. A real choco treat. Happy to know you too liked it. I want it to carry to a friend’s house ,can I do that or they are going to melt? Yes they will melt. You will have to carry in a ice box. I had tried few recipes of your healthy recipes. My kid liked the taste. Can we use sunflower oil instead of coconut oil and sugar instead of palm sugar? Oh god this fudge is just absolutely irresistible. wow such chewy fudge 🙂 looks very deliicous 🙂 I wud love to grab some !! tats a wonderful recipe.. bful clicks.. I am drooling here………pretty clicks!! drooling here. fudge looks simply superb! looks incredible.especially the last click! Omg, killing me, those fudge are seriously droolworthy.